There were 3 citizens living on this island country. "A" owned the land. "B" and "C" each owned 1 dollar. "B" decided to purchase the land from "A" for 1 dollar. So, "A" and "C" now each own 1 dollar while "B" owned a piece of land that is worth 1 dollar. The net asset of the country = 3 dollars. "C" thought that since there is only one piece of land in the country and land is non producible asset, its value must definitely go up. So, he borrowed 1 dollar from "A" and together with his own 1 dollar, he bought the land from "B" for 2 dollars. "A" has a loan to "C" of 1 dollar, so his net asset is dollar. 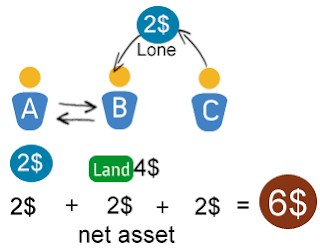 "B" sold his land and got 2 dollars, so his net asset is 2 dollars. "C" owned the piece of land worth 2 dollars but with his 1 dollar. debt to "A", his net asset is 1 dollar. he net asset of the country = 4 dollars. "A" saw that the land he once owned has risen in value. He regretted selling it. Luckily, he has a 1 dollar loan to "C". He then borrowed 2dollars from "B" and acquired the land back from "C" for 3dollars. The payment is by 2 dollars cash (which he borrowed) and cancellation of the 1 dollar loan to"C". As a result, "A" now owned a piece of land that is worth 3 dollars. But since he owed "B" 2 dollars, his net asset is 1 dollar. "B" loaned 2 dollars to "A". So his net asset is 2 dollars. "C" now has the 2 dollars. His net asset is also 2 dollars. The net asset of the country = 5 dollars. A bubble is building up. "B" saw that the value of land kept rising. He also wanted to own the land. So he bought the land from "A" for 4 dollars. The payment is by borrowing 2 dollars from "C" and cancellation of his 2 dollars loan to "A". As a result, "A" has got his debt cleared and he got the 2 coins. His net asset is 2 dollars. 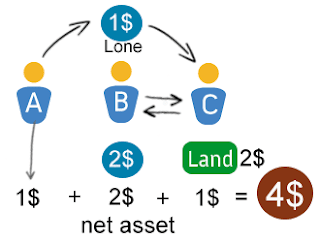 "B" owned a piece of land that is worth 4 dollars but since he has a debt of 2 dollars with "C", his net asset is 2 dollars. 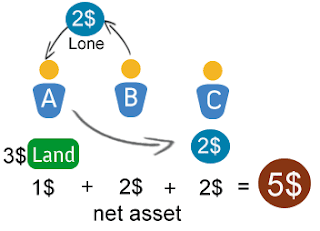 "C" loaned 2 dollars to "B", so his net asset is 2 dollars. The net asset of the country = 6 dollars. Even though, the country has only one piece of land and 2 dollars in circulation. Everybody has made money and everybody felt happy and prosperous. One day an evil wind blowed. An evil thought came to "C"'s mind. 'Hey, what if the land price stop going up, how could "B" repay my loan. There are only 2 dollars in circulation, I think after all the land that "B" owns is worth at most 1 dollar only. "A" also thought the same. Nobody wanted to buy land anymore. In the end, "A" owns the 2 dollar coins, his net asset is 2 dollars. "B" owed "C" 2 dollars and the land he owned which he thought worth 4 dollars is now 1 dollar. His net asset become -1 dollar. "C" has a loan of 2 dollars to "B". But it is a bad debt. Although his net asset is still 2 dollar, his heart is palpitating. The net asset of the country = 3 dollars again. Who has stolen the 3 dollars from the country? Of course, before the bubble burst "B" thought his land worth 4dollars. Actually, right before the collapse, the net asset of the country was 6 dollars on papers. His net asset is still 2 dollar, his heart is palpitating. "B" had no choice but to declare bankruptcy. 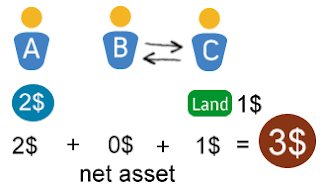 "C" has to relinquish his 2 dollars bad debt to "B" but in return he acquired the land which is worth 1 dollar now. 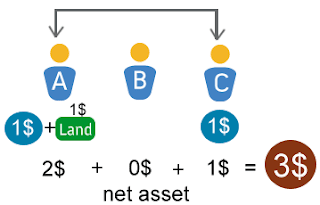 "A" owns the 2 coins, his net asset is 2 dollars. "B" is bankrupt, his net asset is 0 dollar. ("B" lost everything) "C" got no choice but end up with a land worth only 1 dollar ("C" lost one dollar) The net asset of the country = 3 dollars. There is however a redistribution of wealth. "A" is the winner, "B" is the loser, "C" is lucky that he is spared. and hence no foreign debt. The worth of the asset can only be calculated using the island's own currency. Hence, there is no net loss. An over damped system is assumed when the bubble burst, meaning the land's value did not go down to below 1 dollar. When the bubble burst, the fellow with cash is the winner. The fellows having the land or extending loan to others are the loser.. The asset could shrink or in worst case, they go bankrupt. If there is another citizen "D" either holding a dollar or another piece of land but he refrained to take part in the game, he will, at the end of the day, neither win nor lose. But he will see the value of his money or land go up and down like a see-saw. When the bubble was in the growing phase, everybody made money. If you are smart and know that you are living in a growing bubble, it is worthwhile to borrow money (like "A") and take part in the game. But you must know when you should change everything back to cash. Instead of land, the above applies to stocks as well. The actual worth of land or stocks depend largely on psychology.